George Soros (/ˈsɔːroʊs/ or /ˈsɔːrəs/; Hungarian: Soros György; born August 12, 1930, as Schwartz György) is a Hungarian-American business magnate, investor, and philanthropist. He is the chairman of Soros Fund Management. He is known as "The Man Who Broke the Bank of England" because of his US$ 1 billion in investment profits during the 1992 Black Wednesday UK currency crisis. Soros was born on August 12, 1930 in Budapest, Hungary. He was raised in London, England and in New York City, New York. He survived the Holocaust. Soros studied at the London School of Economics. 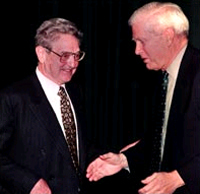 Soros is a well-known supporter of progressive-liberal political causes. Between 1979 and 2011, Soros gave away over $8 billion to causes related to human rights, public health, and education. He played a significant role in the peaceful transition from communism to capitalism in Hungary (1984–89) and provided one of Europe's largest higher education endowments to Central European University in Budapest. Soros is also the chairman of the Open Society Foundations. Soros was married to Annaliese Witschak from 1960 until they divorced in 1983. They had three children. Then, Soros was married to Susan Weber Soros from 1983 until they divorced in 2005. They had two children. Soros is now married to Tamiko Bolton since 2013. Soros is a supporter of the Democratic Party. ↑ 1.0 1.1 "Forbes 400 Richest Americans: George Soros". Forbes. March 2012. Retrieved October 6, 2011. ↑ "Latin America Efforts Honored". South Florida Sun-Sentinel. Fort Lauderdale. June 4, 1998. Retrieved October 18, 2011. ↑ Rolnik, Guy (February 4, 2002). "Business magnate George Soros: I'm afraid to come to Israel". Haaretz. Tel Aviv. Retrieved October 18, 2011. ↑ "A brief history of... Black Wednesday". OpenLearn. ↑ 7.0 7.1 Murphy, Brendan (July 1993). "Finance: The Unifying Theme". The Atlantic (Washington, D.C.). ISSN 1072-7825. https://www.theatlantic.com/magazine/archive/1993/07/finance-the-unifying-theme/5148. ↑ The New Yorker: THE MONEY MAN by JANE MAYER: Can George Soros’s millions insure the defeat of President Bush? October 18, 2004. ↑ "Holocaust Encyclopedia". Ushmm.org. Retrieved October 16, 2009. ↑ Shawcross, William (September 1, 1997). "Turning Dollars into Change". Time. ↑ "Hungary: Soros Donates $250 Million to University in Budapest". IPR Strategic Business Information Database. Info Prod Research. October 16, 2001. ↑ "Why We Must Not Re-elect President Bush". Commondreams.org. September 28, 2004. Retrieved October 16, 2009. Wikimedia Commons has media related to George Soros.